I finally got pictures today! After bath, white scrubbed, mane pulled, etc. The farm that he came from last December did not care for him - he was probably a body score 2 covered in rain rot with big gashes on his legs where he got in some wire. 4-1/2 months of tlc later, he still needs another 75 lbs or so but is a whole different horse! 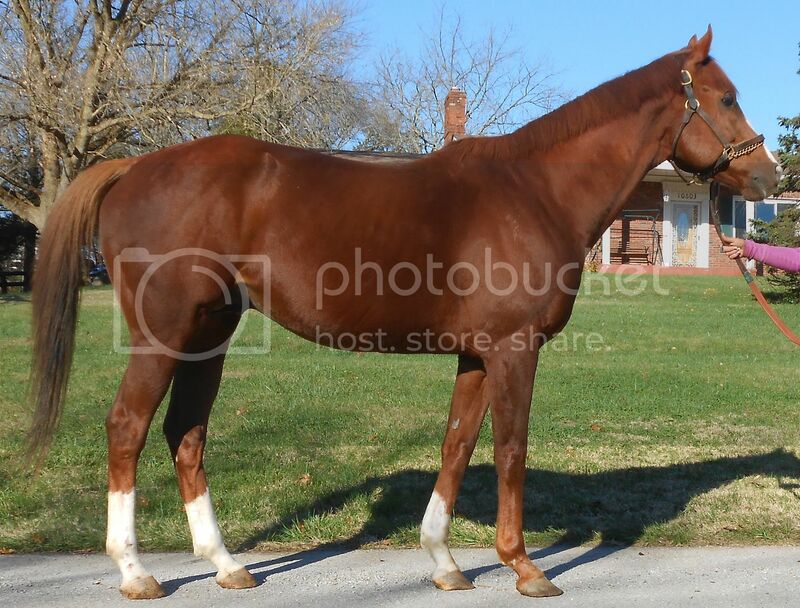 Great Pedgree, Speedy Racehorse And Color To Boot. Last edited by madelyn on Thu Jul 23, 2015 1:34 pm, edited 1 time in total. He is a wee bit skinny still, but he looks great. Thanks! He has gained over 250 lbs. Still more to go. It is a time consuming process, if you don't want to "kill" the horse with kindness. It takes time to build them back up properly. I have four mares in foal to him. He is a very gentlemanly breeder and stops his mares quick. 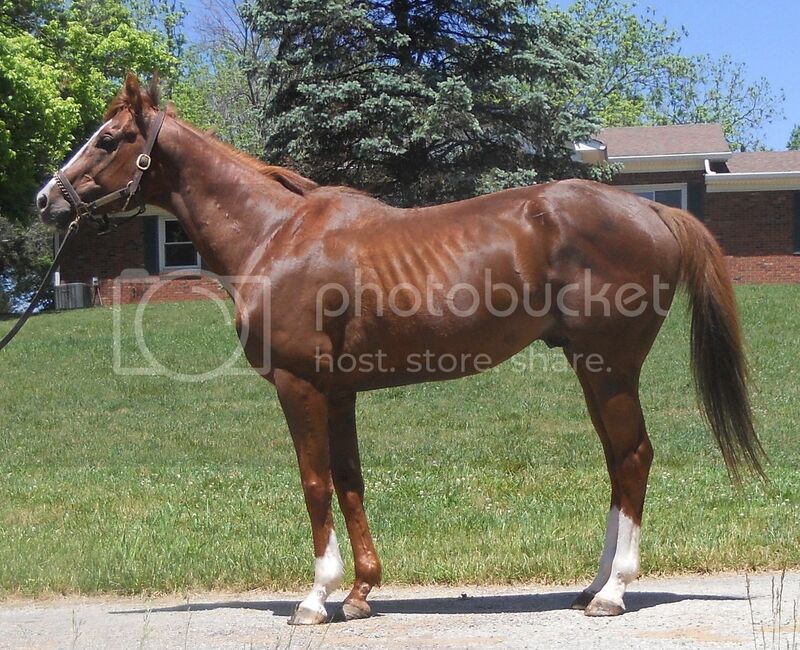 I have a big chestnut mare with quite a bit of white that also has a black patch on her back; can't wait to see what I get (she is bred to Thabit). And it will be a TB! Last edited by madelyn on Thu Jul 23, 2015 1:36 pm, edited 1 time in total. Yes! I love his pedigree..
What a handsome boy, and such a lovely shoulder. Do you plan on doing any dressage work with him as you did with Rocking Trick? I fear that Thabit is not really sound enough to take on anything much more than turnout a couple hours a day and the occasional walk to the round pen to cover a mare. After fracturing his right foreleg in his 3rd start, he had 2 yrs away and then made 18 more starts during which time he bowed his left tendon. Provided we monitor his activities he is fine. 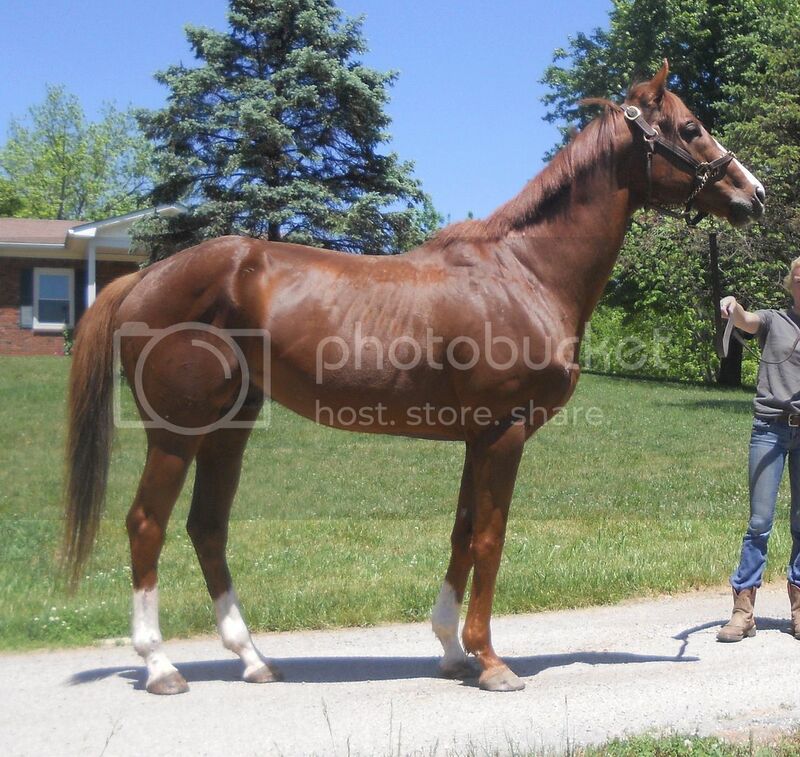 It was proven by other owners before me that on 24/7 turnout he would come up dead dragging hopping lame in the front and then lose a lot of weight. He doesn't know his own limtations. 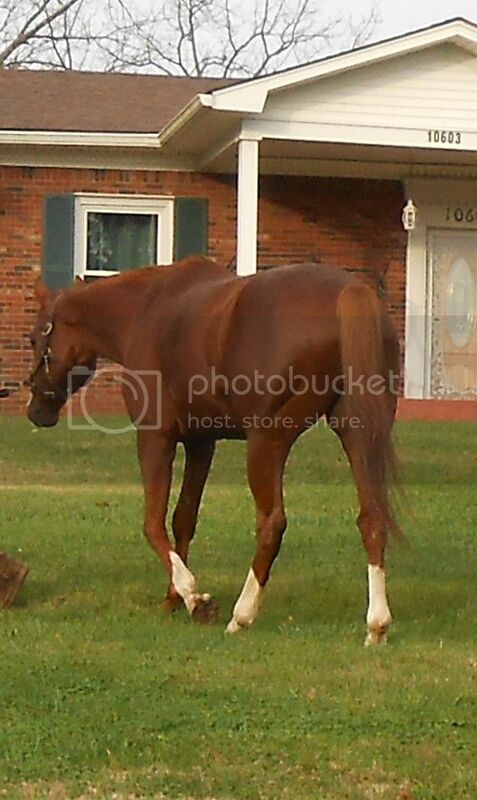 New photos today; his color deepened a lot and I would say he is finally in full body weight. Also aside from when he first got here hopping lame on both front legs, he got sound and has been just fine. We are starting him back under saddle this week and now that I am old an crippled it will be an Aussie Saddle and Bridle and I will teach him to neck rein. I am looking for some kind of boots for his front legs to support the old fractures and the bow. He still has the "best friend" personality and I think he is my horse to grow old with. Happy Holidays Madelyn! Long time... You have done a spectacular job with him, very lovely! I immediately thought when I saw him, photos of the great Swaps and also the great Prairie Bayou. He is just lovely! My fav. color as well. "if they are red, there must be a white blaze and stockings" I always heard that saying since a child; don't know where it came from but I agree, nonetheless. 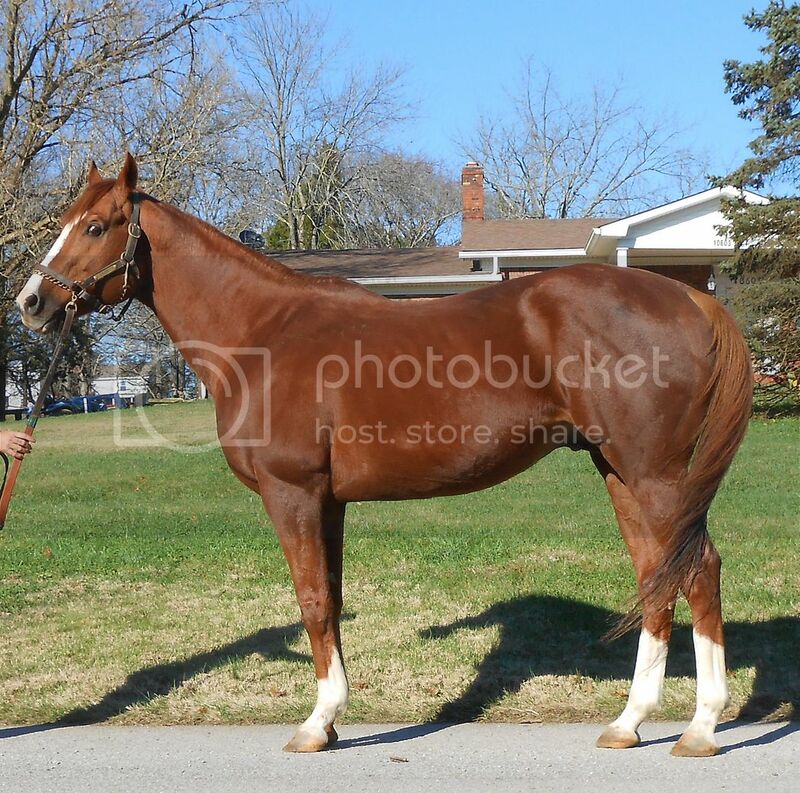 Congratulations, will be looking forward to seeing the foal of the colored mare you spoke of. Thanks! I really love him. Yes, it is one of the more important factors for me when looking at stallions to breed to. I like a good strong solid damline. It is never taken into account in those "nick" programs.